I don’t plan to turn this into a fantasy book review site because those reviews are in their own ways a literary work and I can’t expect to do it without a perfect grasp of English (which is again my second language). I also read slowly so I can’t make a satisfying blog with reviews. They would appear too rarely. So here are some conclusive considerations about “The Great Hunt”. I already commented a few points and those are still valid. 60 pages from the end I still loved the book, then those last few pages left me disappointed as it happened with the ending of the first book. It may sound weird because for most readers the conclusion of the book is where the fun is. The plot threads come together, the action catches up, lots of cool and spectacular stuff happens… But it still didn’t explain enough to retroactively validate what happened in the 600 pages before. This isn’t an ultimate judgment on the book because some of those answers may come later in the next books, but I had hoped in a better conclusion and plots better wrapped up. I still liked the book a lot overall. It is far superior to “The Eye of the World”, better pacing, more original, perfectly handled by Jordan. My impression is that he has everything under control and never slipped once. It’s not the best fantasy I’ve read, but in its kind it was near flawless, as long you accept and are interested in what the author is doing. 1- The pacing. There are certain parts of the book, especially in the middle, that felt slow and redundant. Then the story becomes suddenly interesting once again, but this interest slows down before the end. The pacing was uneven. 2- The ending. “The Eye of the World” had a very poor end. Worse even than Sword of Shannara that is already top of the worse. It felt cheap, predictable and anticlimactic. 3- Tolkien. Some key elements in the story and its development remind of Tolkien so much that you can draw exact parallels through most of the book. So it feels like you already read the story before. What makes this second book so much better comes directly from the flaws of the first. The pacing is improved. A so long story never moves fast, this will always be a trait of the saga, but at least it doesn’t slog, it keeps its pace steadily. The beginning of the book (100 pages or so) is the best part. From a side it reintroduces all the characters and plots from the first book, from the other it unveils so many mysteries right away. It’s a kind of “infodump” that isn’t boring, but that instead becomes the core of the rest of the book. More than once I went back to reread a chapter as I had more elements to figure out prophecies. Instead of a story dragging a mystery till the very end, this time everything is explained at the beginning, like a big setup. Then threads part from that core plot, the pacing slows down, but is kept steady for the remaining of the book. Every chapter has a precise function, it can be summarized in a few lines but it’s planned carefully to serve a purpose. The plot opens up, becomes interesting, the cast expands. I was worried that each book was a repetition of the same plot with minor changes, instead it’s really one big story that moves forward step by step. It flows. Those situations that in the first book felt like rip-offs from Tolkien acquire in the second book a precise role, to the point that not only this second book is better on its own, but it also made me revalue the first. *Everything* from the first book has consequences showing in the second, every tiniest detail and minor character. It gains breadth, felt more original and interesting, and had better pacing overall. So I can say that the story of the first book started in parallel with LotR, but those parallels flew then in a completely different direction, in a broader vision that, while archetypal, is unique on its own and not simply an homage to other works. It acquires its strength and personality. 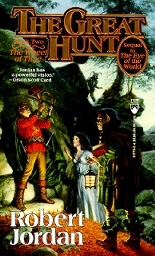 The first book was the “typical fantasy story”. Competently told and planned, but already read too many times. In fact it left me so unimpressed that I wasn’t planning to follow through and read the second book anytime soon. But for various reasons I started it, just to read the first few chapters, but they were so good and interesting that I continued, and then decided to go till the end. My opinion is that the “sameness” was used intentionally to present a familiar story. Set the basis, giving the readers something to hang on and get involved. Something accessible. Which is also the main quality of the series. It’s both ambitious and accessible. Popular and deep. I said this before, it’s not the realistic, adult kind of fantasy, but it keeps a strong consistence in the world and the things happening. So, again, it sticks to a classic idea of fantasy. Heavily archetypal. Plot device: teleporting. The journey is often a core element in a fantasy novel. It’s also one difference between the modern world and the myth of the past, places far away are mysterious places. Places of legend. There’s an idea of unknown, what’s beyond the sea is a mystery. Far away and stranger. There’s a part of this that Jordan delivers exceptionally. For example the way along the story new populations are discovered and how they are entirely foreign one to the other. What happens in the world is unknown, only some echoes arrive, never complete facts. And of course hostility, because who’s felt as a stranger is also felt as a danger, so all these close populations tend to ignore the other or be hostile toward it. Then there’s a part that Jordan does poorly. The journeys in the first two books are a bit inconsistent because characters never go through them completely. There are reasons why many fantasy books have maps, one is that there are journeys. You go from point A to point B, look at the map, figure out how long the journey is going to be. It gives perspective, consistence. But in these books the characters in most cases only go through 1/3 of their journey. It’s like if the journey isn’t intended to be so, but just as a plot device to make a few things happen along, and then, after they happened, the whole party instantly appears at destination. Literally, because Jordan uses two different means of teleporting, one for each book. It feels like a MMO where the sense of space is now rarely respected as there are “shortcuts” that kill the idea of space. It may be good for a computer game, but in a fantasy book it diminishes the consistence, sense of geography, sense of progression. It feels too much like a trick. About the story itself: either you have a simple canvas to then refresh and repeat with each book, or you have to divide the plot between many books. I started reading Jordan knowing nothing and I thought it fell in the first case, to the point that I wasn’t planning to read past the first book because I had enough. I was far from the truth, instead. The plot moves onward, slowly but steadily. Events in the first book were just a set up. Seeds that would develop later on. The story opens up, expands, gains breadth. Never shifting in a new direction. The second book isn’t a sharp turn from the first, but it finally makes evident how everything is perfectly connected and planned ahead. It shows that there’s a vision and that it is quite impressive. Beyond what the first book suggested. And finally the characters. I know it’s fashionable to hate Jordan but I don’t agree with the critics. I don’t agree on the fact that his women are all alike to the point you confuse the names. My opinion is the exact opposite of that. Jordan’s characters are heavily archetypal, so much that they are quickly familiar. If each one has one or a few distinctive traits, then it should be easier to recognize them, not harder. Something archetypal isn’t realistic, but it helps the familiarization. This is what Jordan tried to do from my point of view. Archetypal characters easy to recognize, not easy to confuse. Cardboard cutouts, to an extent, yes. But not alike. The characters are indeed a bit “stiff” and whiny, but not to the point that I find them overly annoying, and not all characters. The development is well done on the main ones, but their acting was too excessively dramatized for me. That’s my main dislike. The evil side instead deserves its own considerations. The real villain is as stupid as in the first book. Completely unbelievable and inconsistent. But at the same time he’s there just for presence, because the true villains in the book are minor characters that are much better characterized, more clever and even more believably evil. Overall I liked the book. My opinion remains about the same I wrote (linked above) when I had read the first 200 pages, with the difference that I expected more from the end, and more explanations about the plot threads. Sadly those last 60 pages left me with the impression that there were too many “deus ex machina” and artifices, but something similar happened with the first book, and the second made me reconsider the whole thing. So I can’t exclude that I won’t get my answers from the next books. I finished reading the first book thinking it was decent but lacking originality. Planning to read the sequel in a distant future. I finished reading this second instead with a greater satisfaction and determined to read the next soon. I know that the quality only improves up to the fourth book (considered the best), then stays good till the sixth. Even if it sinks from there I believe it remains a worthy read. So I’ll go on. I’m reading “The Blade Itself” by Joe Abercrombie now (180 pages in) and it’s completely different. More original, witty, intriguing. It’s a better book, but it’s not the classic tale and kind of pleasure you get from reading Jordan. It’s not that archetypal ideal of fantasy where you can lose yourself, the most pleasant of the journeys and escapism.